I thought I'd share one of my recent Inspiration Boards that I designed for a friend that recently moved to Germany. She only had two requirements: 1) Everything must be available at Ikea...because she needed very affordable options that could be sourced from her new locale, and 2) Everything had to match her dark brown leather La-Z-Boy sofas that their family invested in a few years ago. Without further ado, here it is! We opted to paint her walls a soft gray - "Agreeable Gray" (SW 7029) by Sherwin Williams - in order to counter the gold-toned wood flooring. Simply add in just a few of her European thrift finds she's been scoring at local flea markets, and you have a space that looks anything but cheap. It's bright, colorful, eclectic, and fresh...something a family with two young boys can enjoy for years to come. If you have any questions about the sourcing of certain items, I'd be happy to share details with you. Ask away in the comments section below! Or, if I can do an Inspiration Board for your space, please drop me a line at inspiredwhims@gmail.com. Very cool Kristen! 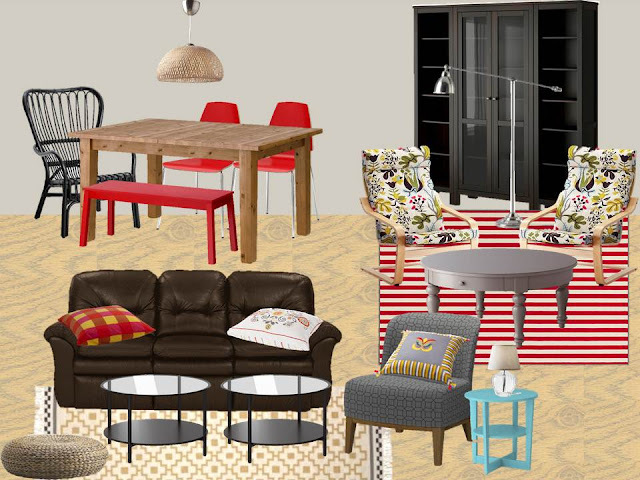 I like the idea of mixing eclectic with Ikea. Takes the prefab edge off!